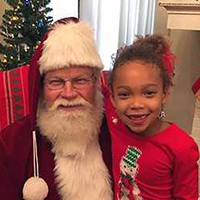 The Webster University Alumni Association invites Webster community members to bring their families to the "Cupcakes with Santa" event on Saturday, Dec. 8, at the Love Foundation Alumni House. Follow Santa's elves as they guide you through the Alumni House to the North Pole. Children can make crafts, enjoy cupcakes, hot chocolate and other sweet treats. Children will also have a chance to tell Santa what's at the top of their list this year. Don't forget to bring your camera and your holiday cheer! Space is limited to 25 children per session, with a $5 per child cost. Sessions are filling up fast, so RSVP today! Please arrive no earlier than five minutes prior to the start of your session. Attendees should RSVP no later than Tuesday, Dec 4. For more information, contact Corinne Hilbert at corinnehilbert@webster.edu or 314-246-5961.